With version 5.1, NextReports Server implements a much-desired feature: message notification. In previous versions, when a report was manually set to run, user was redirected to Monitor section. 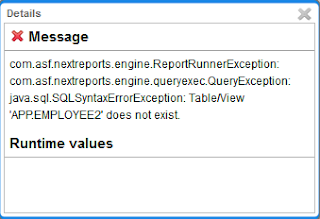 Here running processes can be seen and with an auto-refresh at some time the result will appear in history table, containing the link to the document. In current version, after a manually run, a message in the top right corner will notify that the process started and that a new message will be issued after finish. This first message has a short life of 5 sec and it will disappear after time elapsed. When process is finished, a new message will be shown containing the link to resulted document. This message will live until the user will close it. If an error occurred during export process, an error message will be shown. 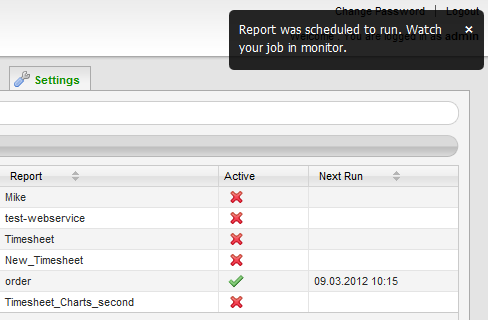 To see the actual error user has to go to Monitor section and look in history table to "Success" column. If you schedule a report, you will only be notified about it. No messages when the process is finished will be issued. To implement this notification feature, NextReports uses wicket-stuff push and jQuery jGrowl. To use jGrowl in Wicket it's easy with an AjaxBehavior. Messages will be kept in Session FeedbakMessages list. All options of jGrowl can be found here.